Laptops are preferred compared to personal computer systems. Even though modern computers are more attractive and less bulky, laptops outdo them in terms of convenience. In fact, you can even spot them as you walk around or even in your local coffee shops. Almost everyone has one, be they a student or a professional. Such rise in popularity is what has also created the demand for laptop accessories as well. 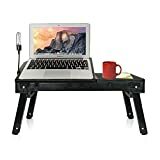 I bet that is the same reason why you are looking for the best laptop stand. Spending most of the time hunched over while using your laptop is not advisable. Not only will it cause you discomfort but you may eventually end up with some health issues. Your back may suffer, you may constantly get cricks in your neck, and your posture will also be affected. The best laptop stand will help you avoid all this. Using a decent stand will also enable you to rest your arms at an appropriate angle. In the end, you will be more comfortable and even type a lot better too. When you make this purchase, you will be getting a work surface which can expand from 13 to 22 inches. You can use the Table Tote stand to place your laptop and projectors as well. What’s interesting about it, is the fact that it is a very popular choice among professional and student debaters. This may also be due to the fact that it can be fully extended for use while seated or standing up. The stand also comes with a free document holder which is also a bonus. The legs can be adjusted from 12 to 29 inches. You will not require any tools to put it together. Superior comfort is the name of the game when it comes to DG Sports laptop stands. 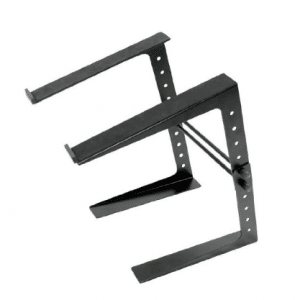 These stands are exactly what you need to help increase your productivity. The optimal comfort levels are possible thanks to the laptop stands 4 pre-set positions. Every detail about its design serves a purpose in enhancing your user experience. You will be impressed by the stands integrated cooling fan. Thanks to this, you won’t have to worry about your laptop overheating. In order to power the fan, you will need to plug in its USB cable into your laptop. The benefits of having this stand just keep adding on. You are going to love this if you tend to read books in bed. It has an LED light which will provide the workstation with illumination. The laptop stand was also designed with accessory components and it also has 4 USB hubs. The stand also has a mouse pad. Its legs can be set to 2 different heights. 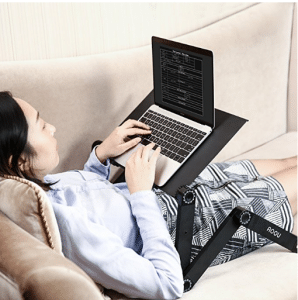 A flexible laptop stand is something you can’t do without once you get one. This particular one can be adjusted at 360 degrees. 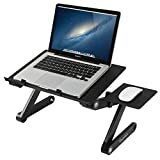 That is what will enable you to use the laptop stand while standing, seated and even laying down. You will have so many options and it will stay in position thanks to its auto-locking joints. I would recommend this to individuals who have laptops from 17 inches and above. The stand top is iron, while the legs are made of plastic. This is a multi-functional stand and can also be used as a writing desk or even for a Sketchpad. When folded it has dimensions of about 19.3″ x 2.3″ x 11.2″. The actual panel size is 16.5 × 10.2 inches and it can be fully extended to 19 inches. The laptop approximately weighs 3.6lbs. You will also get a mouse holder. Great quality laptop stands are made such that will last you for a longer period of time. They are far more durable than the average market options. The AOOU stand has a tray made from high-strength aluminum. The automated locking joints were made using sturdy adjustable ABS. The joints are 6 in total and the stand also has 2 non-slip buckles. You will definitely feel confident about using it with your valuable laptop. One other valuable feature it has is that it comes with 2 built-in cooling fans. Active heat dissipation will be assured thanks them. The fans are also silent and will not distract you. It was designed to be strong enough to serve as a dinner table, for sound equipment, a TV stand, tablet holder, book holder and even as a writing desk. The laptop stand has a 24 months warranty. You will also get a 30 days money back guarantee. To prevent the stand from getting quickly worn out, it was designed with a silver-anodized powder coated finish. I would recommend this stand for anyone owning a 9.4 inches laptop depth or lower. It works great with Apple MacBook, MacBook Pro 13-Inch, and MacBook Air. 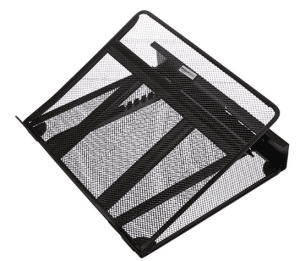 Your workspace will be more organized than usual thanks to the stand’s Cable Organizer. You will be able to stow away the keyboard and mouse cables neatly. AmazonBasics took air circulation into consideration when they made this stand. That is why they designed the laptop stand to tilt forward as well. As a result, you will also be able to view your laptop much better. Using it will also put the laptop screen at your eye level. This is because the stand will raise the computer screen height. The height raised will be about 6.1 inches in total. The stand’s design has an elegant profile to it. It is also backed by an AmazonBasics 1-Year Limited Warranty. At number five we have yet another universal laptop stand. This option would also make a great fit for using with DJ equipment and turntables too. It is ideal for use in any location, from the office, business purposes, home and school as well. I found its height alignment quite impressive. The recommended time to use this laptop stand is when shorter monitor eye-level is needed. Your laptop won’t fall while you use it. The stand has slip-resistant legs to prevent that. It was constructed with 4 line-it-up bars and has a pair of support bars. You can be sure that it was built using quality materials and your money is well-spent. 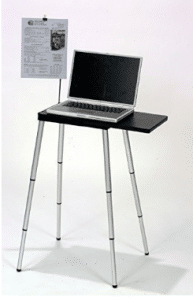 The laptop stand has an engineered chipboard which can support up to 44lbs. It was made with an ergonomic riser standing design. 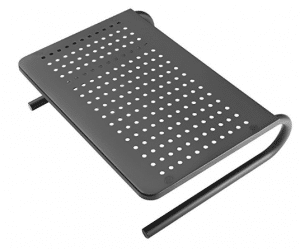 This time around we are going to look at a ventilated laptop stand from Amazon. If you are constantly concerned or worried about your laptop crashing, I would advise you to buy this stand. You are guaranteed that your laptop will run much cooler. The stand’s platform is made from metal-mesh so that it can draw away heat. Your reading and typing will be more comfortable than before and the airflow will be increased as well. The stand has 6 slots for cable organization. 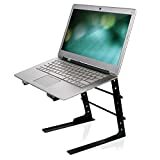 The laptop stand can be adjusted from 12 to 35 degrees. HUANUO has one of the best organizational options. They designed it to solve more than one issue and that’s what places it ahead of other laptop stands. It is great for people who want to free up desk space and are dealing with clutter. 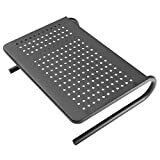 The stand has space under it which can be used to place a cable box, gaming devices, and papers as well. The solid steel construction is quite reliable as well. The laptop stand raises by about 4 inches. You are going to love this if you have an Apple notebook. This rain design laptop stand was designed with a Sand-blasted and silver anodized finish. It is perfect to match your notebook with. 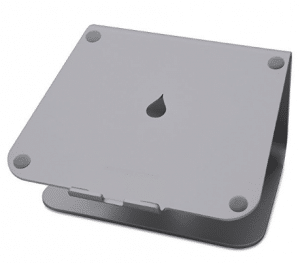 The stand is also compatible with Apple MacBook Pro, MacBook Air, and MacBook. If you have a laptop with a depth less than 10.4 inches, you can use it as well. 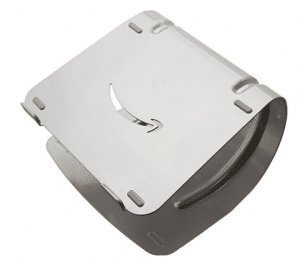 The solid stability from the laptop stand is thanks to its single piece aluminum design. In order to cool your laptop, the company intended the aluminum panel to also act as a heat sink. The stand will raise the screen to 5.9 inches. It also has a keyboard stash. This is the best of what the market has to offer. You need not look any further if you want a top-notch pick. When it comes to portability, the laptop stand is very light in weight. You won’t experience any issues at all when carrying it. If you end up dissatisfied with this purchase, you are guaranteed to get a refund. So try out this risk-free purchase, and experience complete convenience. The stand has USB powered cooling fans. 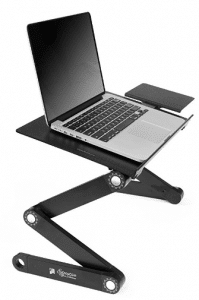 The stability of the laptop stand: while using your laptop, you need the stand to be stable. That is why it’s important to check how sturdy the stand is before making a purchase. Is it space saving? Ensure that the laptop stand has a reasonable size. You need it to take up as little space as possible. Portability: the laptop stand should be easy to carry around. 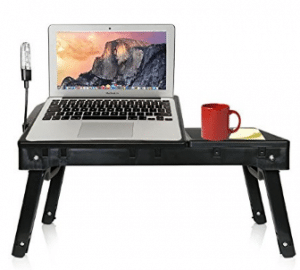 From its weight to its size, the best laptop stand should allow you to work on the go. Make sure that it can easily be set up in different locations as well. Features: some laptop stands are equipped with very useful features. Make sure the one you buy benefits you and your laptop in more ways than one. That way, you will be saving more. They are ergonomic: Using a laptop stand enables you to sit in a proper posture. That is one of the reasons why they are highly recommended. They help maximize your comfort when using the laptop for long hours: This is very important because it will help you avoid long-term complications. When you are comfortable, you won’t strain your body or eyes as well. A laptop stand will help cool the machine’s hardware. Your laptop will become better ventilated when raised off any surface. This will also help reduce any risk of damages occurring to your computer. 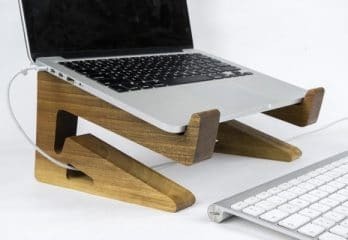 Out of all the 10 best laptop stands in 2019, you can’t fail to get one that suits you. What you need to do as well, is to make sure that your laptop and stand will be compatible. This especially applies when it comes to the laptop depth.